Up to ten years or so ago, I knew very little about Leitz microscopes. Although they are widely used in academia, very few happened to be in the geology labs where I worked. They were not particularly good looking to my eyes, and with this prejudice I thought I would not like to actually own or use one, especially the older black enamel models. What a mistake! 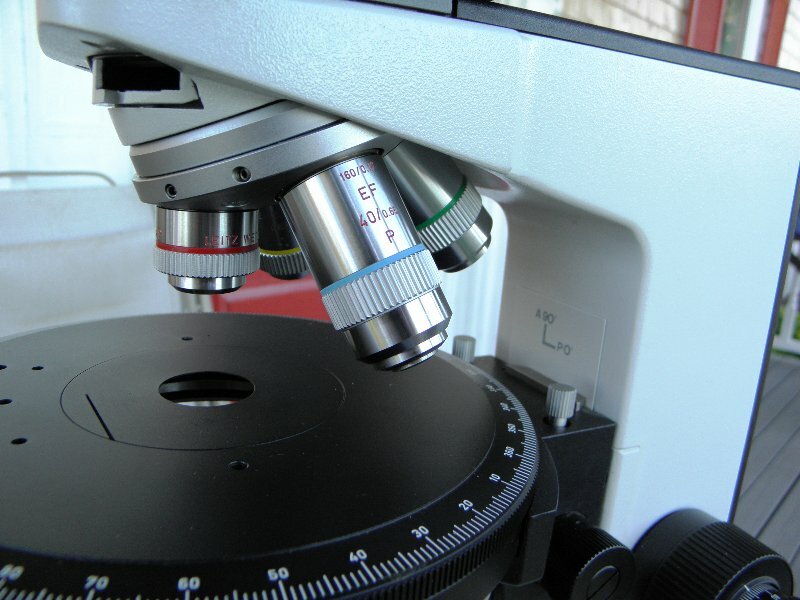 In fact, Leitz microscopes are extremely well designed and constructed, including superior optics, and after you have one, you will regard it as a very satisfying and handsome instrument. There is no substitute for quality, and Leitz was at the peak. After owning and renovating more than 30 Leitz microscopes as part of my hobby, I know this for a fact. 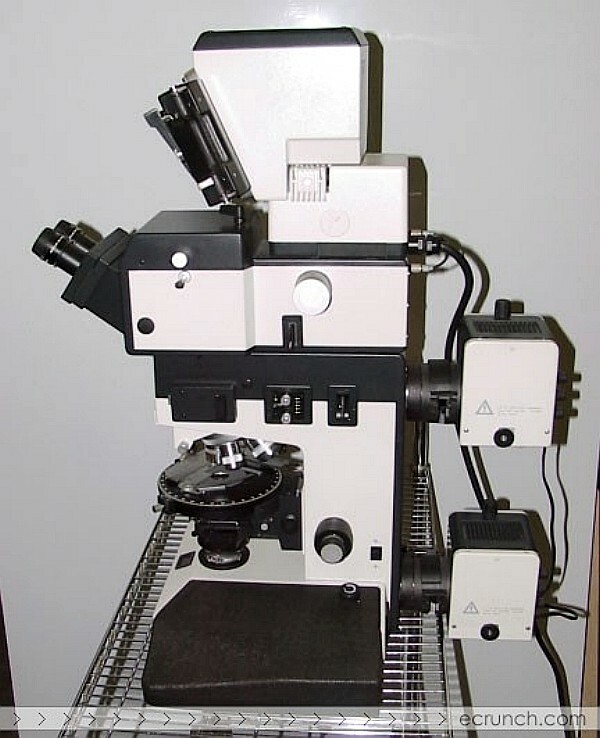 Information about Leitz microscopes is rather scattered and not always easy to find, so as more photos and links come my way, I will post them here. Because of my background in geology, a lot of the ones I know are polarizing or petrographic versions, but all types will be included. A very fine article about black enamel Leitz scopes made between the late 30s and early 70s has been written by Gregor Overney and Normand Overney, and published in Micscape magazine (March 2008). You should definitely give it a read. The descriptions, texts, documents, and images on these pages are for your information only, and they all have legal copyright protection. You may not use, copy, or change any of files or images on these pages without specific permission from their owners. Also see this repository of Leitz catalogs (free to download, but donations are requested). In 1849, Karl Kellner founded the Optical Institute in Wetzlar, Germany. Telescopes were the original emphasis, but within a few years microscopes took over as the main product. The company hired a very capable engineer named Ernst Leitz in 1865, who soon became a partner. Leitz took over the company in 1869 and renamed it Optical Institute of Ernst Leitz. A revolving mount (turret) for 5 objectives was introduced in 1873, and the company’s reputation grew rapidly. 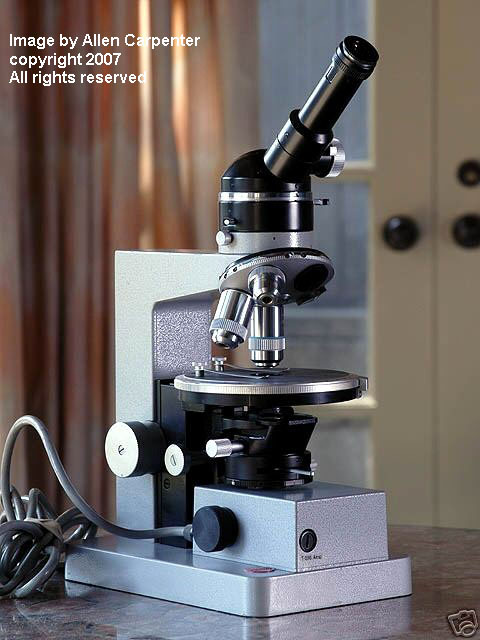 In 1889, the company had 120 employees and produced its 15,000th microscope. In the time between 1889 and 1911, several new products were added to the line, including still and cinematic projectors, binoculars, and a variety of specialist optical equipment. Leitz produced polarizing microscopes after 1885, and by 1890 there was a specialized petrographic model in their catalog. Demand was enough for the first of many special catalogs for polarizing microscopes and accessories in 1893. 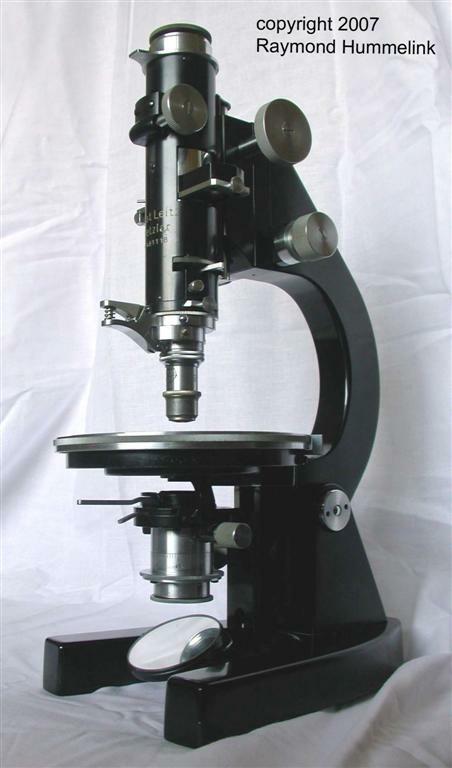 By the 20th century, Leitz was using the “modern" style of microscope stands, with horseshoe feet and a curving limb to the tubular head, which continued until after the second world war. 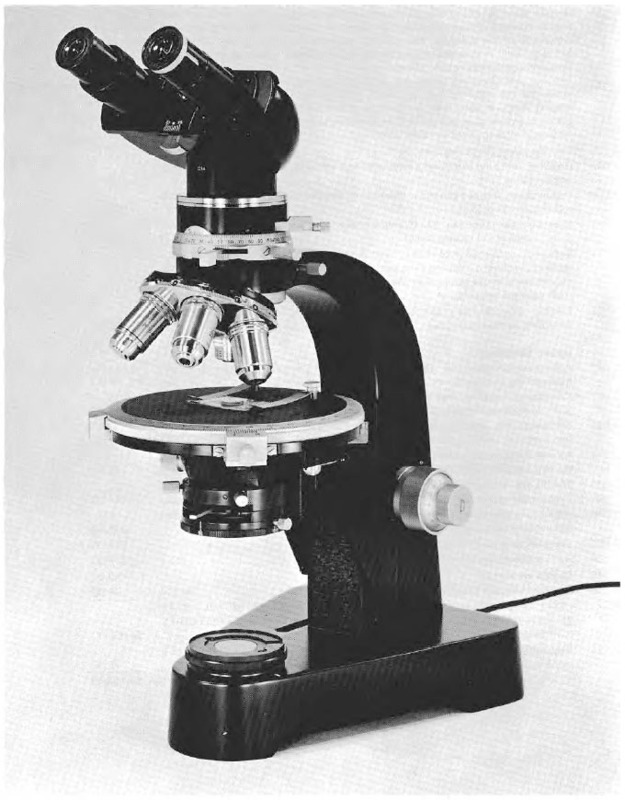 As did Zeiss and other companies during the 1950s and 60s, Leitz adopted newer styles of microscopes with rectangular hollow frames and feet, internal illumination systems, and modular (add-on) systems for phase contrast, dark field, polarization, photomicrography, and other methods. 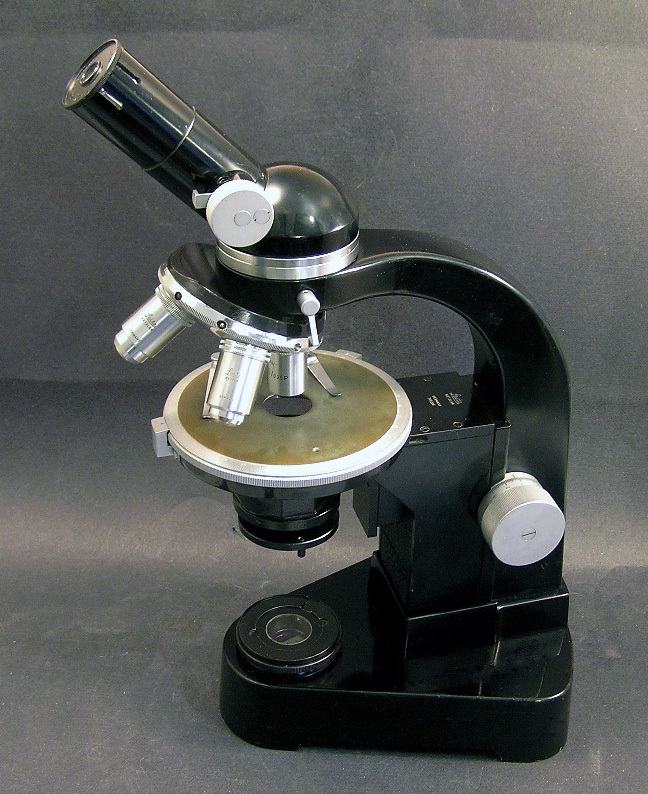 Like other makers at the time, Leitz used a durable glossy black baked-on enamel finish for most of their microscope models, until finally converting to light bluish-gray colors in the 1970s. In 1912, Dr. Max Berek (1886-1949) joined the Ernst Leitz Company after he had finished his studies in mathematics and mineralogy in Berlin, and he later designed the first Leitz camera lens. Starting in 1924, cameras became an important product for the Leitz company, including the first practical 35 mm camera. Prof. Berek won world fame for his theories and inventions in the area of polarized light microscopy; the Berek compensator and his formula to compute depth of field in microscopes are still in use today. He also invented an anti-reflective lens coating, a great advance in optical resolution. During WWII, the German government revoked his professorship because he refused to cooperate with the Nazi party (he was reinstated in 1946). Dr. Berek worked at Leitz until his death in 1949. Ernst Leitz died in 1920, and his son Ernst Leitz II became the sole owner of the business. During the 1930s and 1940s, Ernst Leitz II and his daughter Dr. Elsie Kuehn-Leitz, both Protestant Christians, arranged for hundreds of Jewish employees and their families to get out of Germany, thus escaping the Holocaust. 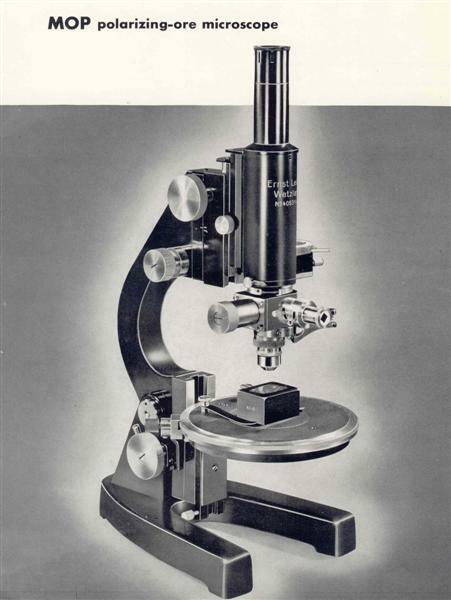 After the war, several years went by before Leitz (via its partner Leitz New York) could re-enter the huge American microscope market. See the brochures linked below that are dated from 1949 to 1952 for examples of the post-war models. However, before 1960 the new and excellent black models that are still familiar and popular became widely available. The excellent benchtop research model called Ortholux was developed around 1937, which was larger and more modular than earlier forms. The curving frame reminds us of certain pre-war modernist styles, as also does its competitor the Zeiss Universal. The Ortholux was more successful for higher-budget markets, and so a slightly smaller and less expensive model was produced in the 1950s, called the Dialux. Now sometimes referred to as the Dialux 1, it resembled the Ortholux 1 in form and so is also called a "baby Ortholux." These two models were popular, with a long production run, and they were so well made that many are still in regular use today. In 1952, Günther Leitz founded the Canadian Factory to make Leica cameras. After the death of Ernst Leitz II in 1956, his sons -- Ernst Leitz III, Ludwig Leitz and Günther Leitz -- took over management of the Leitz firm. Reports are that no love was lost between Leitz and its main competitor Zeiss, and the two companies tried hard to make their products quite distinct from one another. On the other hand, it is easy to see some design similarities between Leitz scopes such as the black Dialux, and Wild Heerbrugg models such as the M20, and those companies apparently were on friendlier terms. 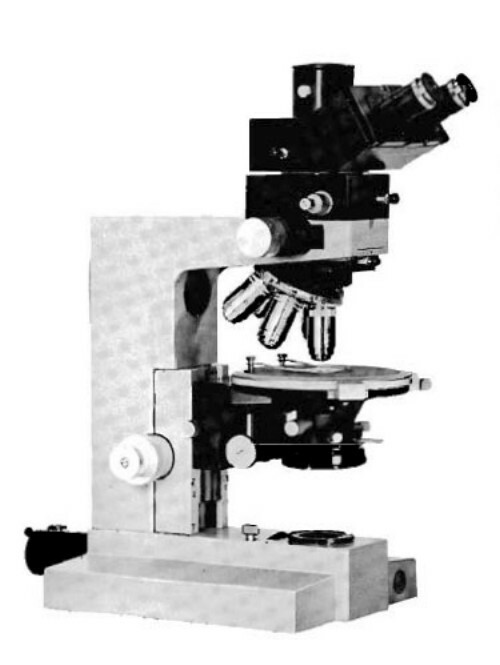 By 1970, there were six models of polarizing microscopes marketed by Leitz. From small to large, these were the SM-pol, Labolux-pol, Dialux-pol, Epilux-pol, Ortholux-pol, and Orthoplan-pol. Unlike earlier versions, the Labolux, Dialux, and Epilux had similar stands and other shared parts (still in black enamel finishes), but with bayonet head attachment, not the rotatable dovetail of the biological types. Prices in 1971 for stands fitted with middle-level optics ranged from around $1300 for a monocular SM, $3000 for a binocular Labolux, $4100 for a trinocular Dialux, $5500 for an Ortholux, and $6200 for an Orthoplan. Using the consumer price index, $6200 in 1971 is equivalent to around $32,000 in 2005. Even so, it was hard for Leitz to make much profit on the top-of-line Orthoplan, for which they went all-out to be better than any other maker’s equivalent model (for example, the Zeiss Ultraphot). Leitz produced the Orthoplan from 1966 until 1991. In 1973, Leitz Portugal was founded with a factory in Vila Nova de Famalico, near Porto. This plant supplied many microscope heads and eyepieces for Leitz, and now for Leica. 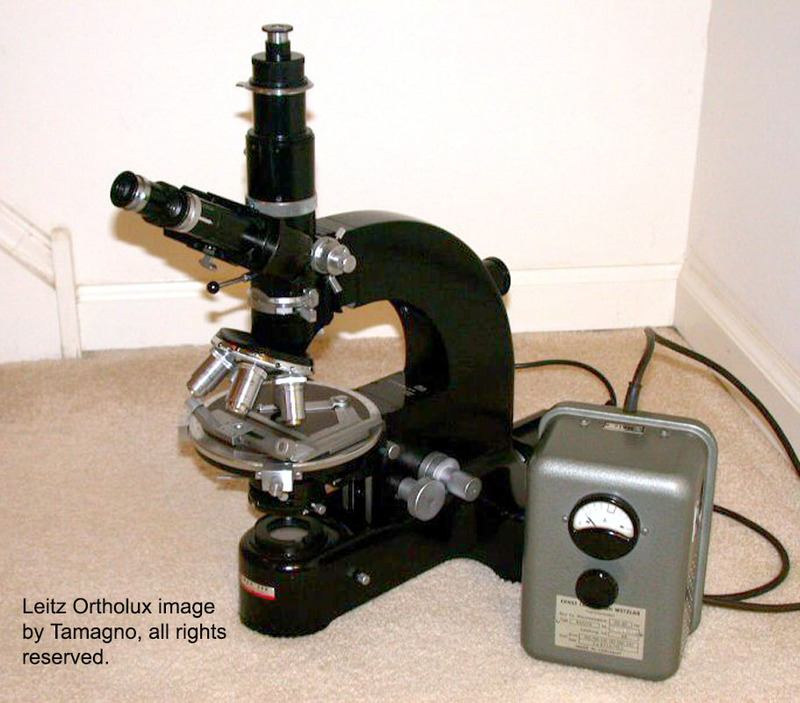 During the 1970s, competition increased from several companies in Japan, especially Olympus and Nikon, which were producing modern microscope designs of excellent quality at relatively low prices. Several venerable microscope companies closed, merged, or were bought out in Europe and the USA. 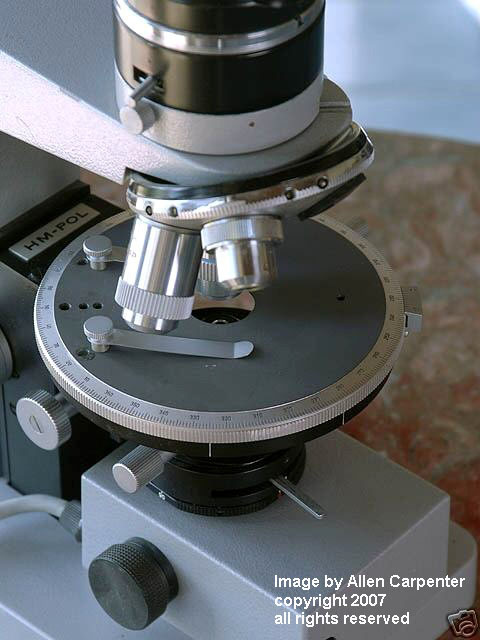 Wild Heerbrugg bought majority ownership of the Leitz Wetzlar company in 1974, but Leitz continued to develop their new lines of compound microscopes to replace the older black styles. Styles were changing in the 1970’s, included a gradual switch from 170 mm to 160 mm tube length optics, and later to infinite length, using 45 mm focal length objectives and wide-view oculars. The classic black finish machines designed in the 1950s-60s (still considered by many people to be the best) were replaced with boxy rectangular-frame light gray models such as the HM-LUX, SM-LUX, Dialux, Ortholux-2, and so now the Orthoplan (almost unchanged) more closely resembled other Leitz models. See the photo below. In a 1985 catalog, four polarizing models were available, now in an off-white rectangular style with slightly rounded edges and dark trim. The name of Laborlux was used rather than the earlier Labolux, still a source of confusion. The Laborlux 11 Pol (replacing the SM-Lux) was the student pol model and often used a monocular head, with a 10-watt lamp in the base and fixed condenser. The Laborlux 12 Pol (replacing the Labolux/Dialux pol models) was the lab and clinical model with a more powerful Koehler lighting and upgrade condenser. Both of these used 160 mm tube length objectives. The research line still had the Ortholux 2 Pol BK and Orthoplan Pol, the latter hardly changed from the 1960s but now looking more like other models in its style. Objectives of 170 mm tube lengths were made only for low powers for these machines. Nearly all objectives were 45 mm parfocal length. Leitz retained the Dialux name in the 1980s with the Dialux 20 model, which was advertised as a collaborative effort with Wild to make a worthy successor to the Dialux and Wild M20 (thus the 20 in its name). The Diaplan was introduced in 1985 as a research oriented model one step up from the Dialux 20/22, and by 1988 the Aristoplan/Aristomet was superseding the Orthoplan as the top model. The magnificent Aristoplan was a very large research microscope marketed to well-funded laboratories (a well-outfitted version could exceed $100,000). The last member of the Leitz family retired from the board of directors in 1986. At the beginning of 1987, Ernst Leitz Wetzlar GmbH and Wild Heerbrugg AG merged to form the Wild Leitz Group. The new company had 9,000 employees in several countries. Wild stopped making compound microscopes in favor of Leitz, but continued its excellent stereoscope models as well as other optical equipment. The Wild Leitz Group was broken into smaller companies in 1988, and Leica Camera was split off. The merger of Wild Leitz Holding AG with the Cambridge Instrument Company in 1990 created the new Leica Holding B.V. group. The Leica name is now used for all microscopes (still high in quality), surveying and photogrammetry systems, and other scientific optical instruments, while Leica Camera Group is an independent company. 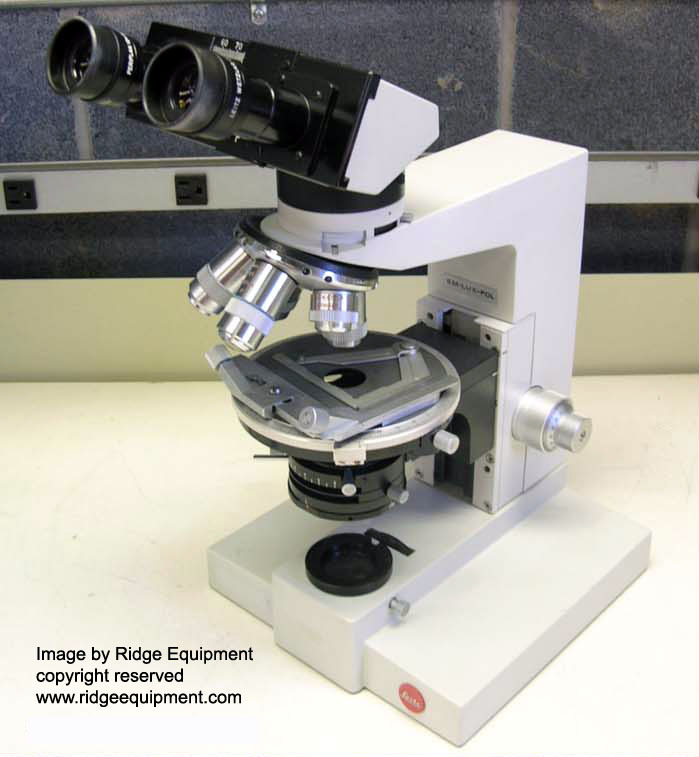 Although student models of Leica microscopes are now made in China, and stereoscopes are from Singapore, some models are assembled from parts and pieces from Leica factories and contract companies in several western countries, including optical parts made in Germany. But they are Leica, not Leitz. Note: photos and pdf files with credits are personal property of the contributors, and copyright protected. The ones posted here are for your personal information only, not for sale or commercial use including eBay without permission from the owner. I don't own most of the document copyrights, but pdf files I have scanned from documents in my library are also my property. If you notice that someone has stolen a photo or pdf file from here for their profit, please let me know. Leitz microscope line in the late 1970s, from The Microscope and its Applications, by Determann and Lepusch. 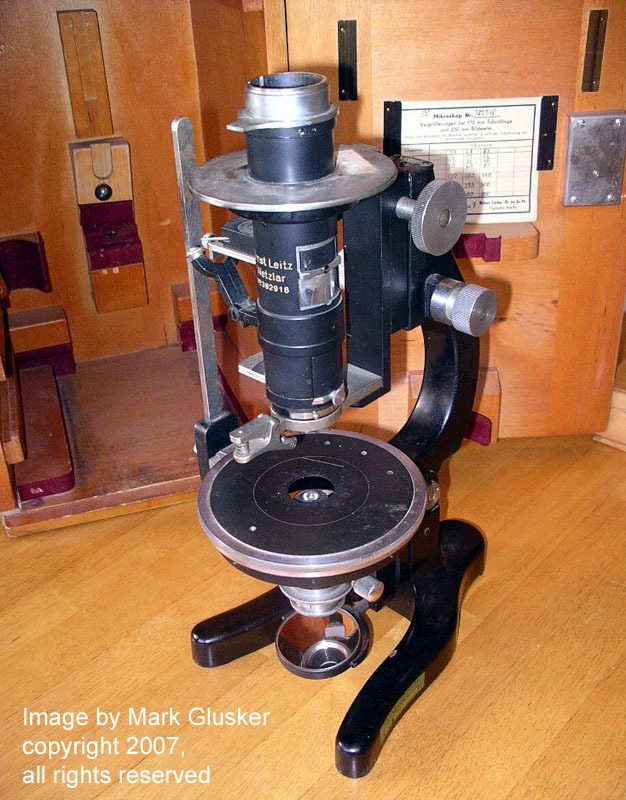 Vintage polarizing microscope, s/n 382918 from 1947 (see Mark Glusker's page). The vertical side arm connects the lower and upper polarizing filters, so they can be moved (together) instead of rotating the stage. This allows certain types of fragile samples to stay still. 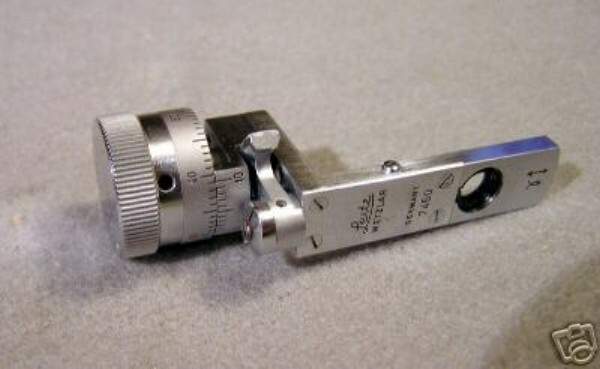 Similar connecting polarizer-analyzer rods were also available for B&L and Wild pol scopes, among others. MOP "metallic ore polarizing" reflecting light model, for geological uses. 1940s and 50s. SM pol, (mid-1960s?). This earlier version of the triangular base had a rounded back for the SM as well as Labolux. SM or student models usually used a removable lamp holder or a mirror, each with a pin to fit a hole in the foot beneath the substage. "Lux" in the name indicates the light source is built into the base -- see the next example. SM Lux Pol (1967). The bayonet-mount monocular head has a 30 mm eyepiece tube, with a Bertrand lens in 2 pieces -- pinhole and lens -- that swivel in and out via the knob and lever on the side of the tube. The black SM model has a shorter base than the Labolux and Dialux, and the housing of the stage connecting section runs to the base rather than angling in toward the stand riser. The SM also has a 4-place nose turret that is not removable. This SM is unusual in having an internal lamp base rather than a flat base with a flashlight style lamp. HM Lux Pol. 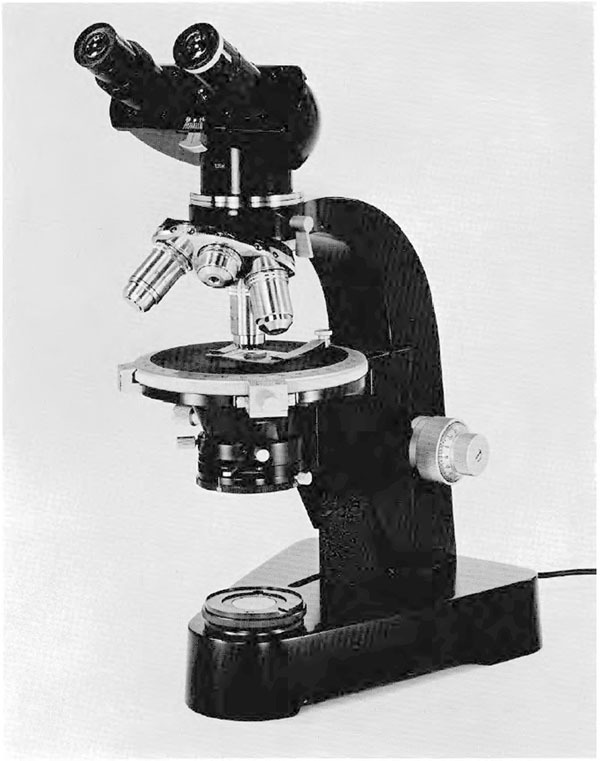 Monocular heads were common for student pol microscopes, but a binocular head was available for this model as well. Late 70s. SM Lux Pol, circa 1980 (but the head looks newer). This later version of the SM had an internal 10 watt lamp and transformer, and a removable condenser. Labolux-pol, circa 1970. 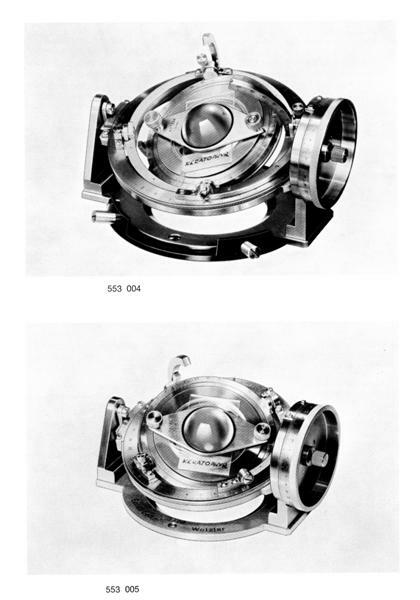 The Laborlux and Dialux had a triangular base thick enough to hold a lamp tube, which reflected in a mirror in the field lens through a removable field diaphragm up toward the condenser. An external power transformer is required. Relative to the SM Pol, the Labolux Pol had a slightly larger stage, a thicker frame arm, a stage connection housing that angled inward, and a removable 5-place nose turret (all 5 holes centerable). Unlike the Dialux Pol, the Labolux Pol had an analyzer in the arm beneath the head that swiveled in and out via a side lever, like the SM Pol. Labolux, trinocular biological brightfield benchtop, s/n 661500 (mid-1960s). Earlier Labolux stands have a rounded back side of the base, but later versions have three straight sides of the base like the Dialux. Laborlux 11 Pol, circa 1988. A student/clinical model with a fixed condenser and simple funnel lamp. Laborlux 12 Pol, late 1980s. This was one of the last but best efforts from the combined Leitz and Wild engineers. 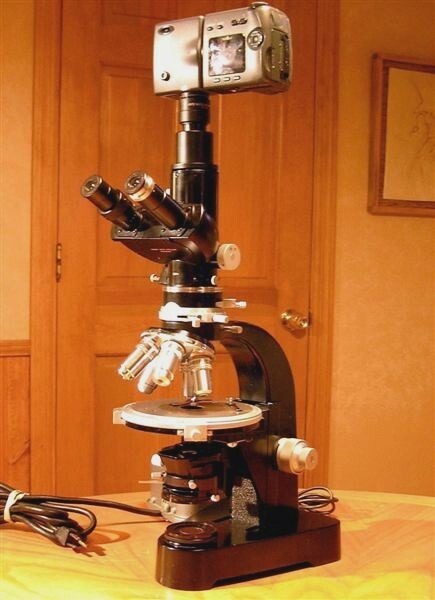 An extremely competent microscope in every way and a pleasure to use. 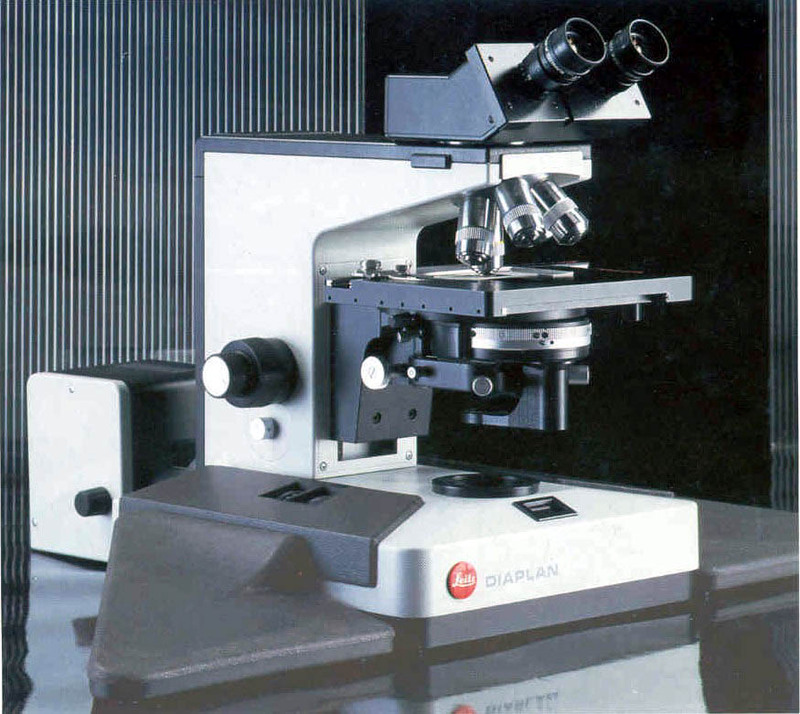 Laborlux S, late 1980s. A fine clinical/benchtop model made in the Leitz Portugal plant. It uses a detachable lamp house (20 watt halogen) powered by a 6 volt transformer in the base. Otherwise similar to models 11 and 12. Other lamp houses for 50 and 100 watts were powered by external transformers. Dialux-pol, circa 1970. The camera is a Nikon 990 digital with a relay Leitz Periplan 10x high-eyepoint eyepiece, which has a thread that screws on to the camera (a case of serendipity). 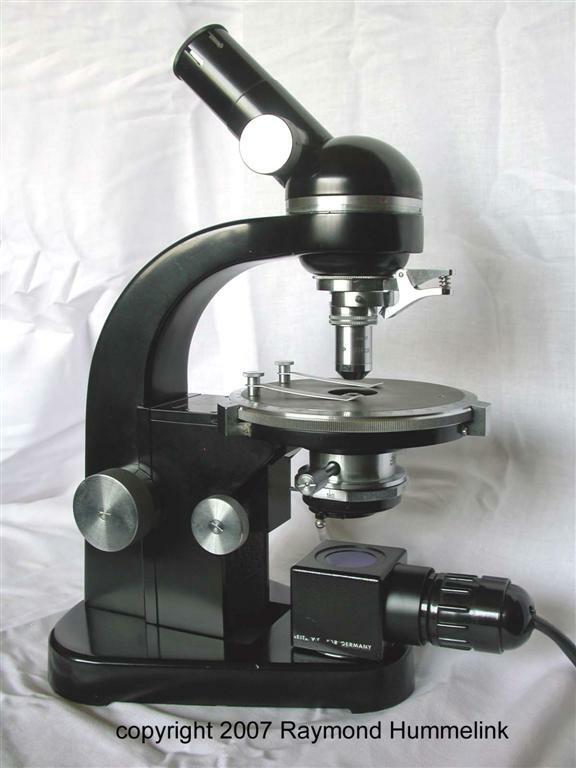 This model was among the best "black enamel" benchtop microscopes ever made, and it remains in demand. 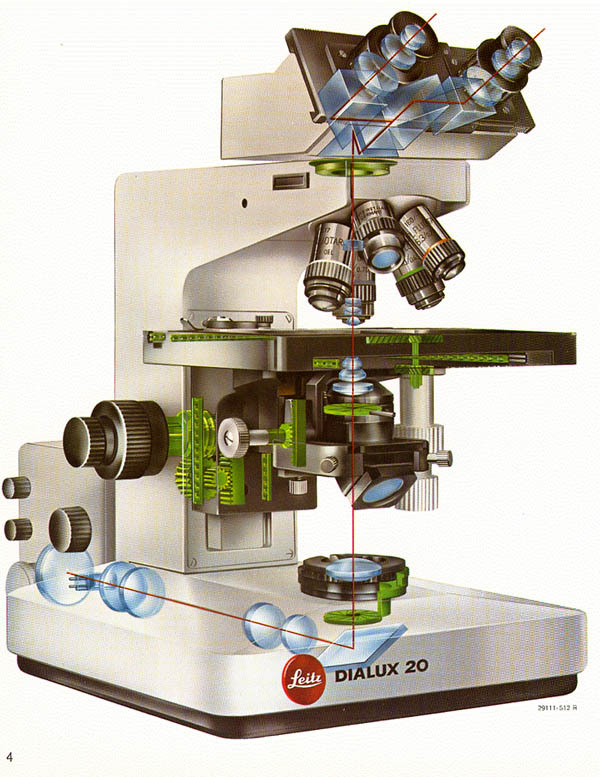 Dialux 20 (late 80s), described as a replacement for the Wild M20 as well as the Leitz Dialux 2. Image from a Leitz brochure. Diaplan, introduced in 1985 as a step above the Dialux 20. Image from a Leitz brochure. Eyepieces of FN 20 were standard along with a new line of Plan objectives, but along with a special nosepiece, head, and apochromatic objectives, eyepieces of FN 25 and FN 28 were also available (see the brochure below). Ortholux-pol, 1960s. The head with tube and turret assemblies attaches to a vertical dovetail on the front end of the arm. Most versions have two places in the back for a lamp holder, one at the base for transmitted light and a second higher in the back for incident (reflected) light. Incident light requires a tube in a special turret to conduct light to epi objectives. Ortholux Reflecting or Epi (1971 catalog image). Set up for studying opaque ore minerals, or for metallurgical work, using reflected light that can be polarized. Ortholux 2 Pol BK, early 1980s. The stand was a major change from the classic Ortholux, but optical parts and tubes appear similar to the Orthoplan's. Photo from Patzelt's Polarized Light Microscopy (Leitz, 1985). Orthoplan-pol (1971 catalog image). Set up with both transmitted and reflected light sources. Using it with the upper lamp holder for incident lighting would require switching to a special epi-turret with a tube to conduct the light into the epi-objectives. Quick and easy to do. Orthoplan, circa 1981. Set up with plan objectives for brightfield observations. Leitz spared nothing to design and construct this large research instrument, which was expensive to buy but even more expensive to build. Leitz Wetzlar Aristomet, with BF, DF, DIC, and POL accessories (especially for incident light, for metallurgical or ore mineral studies). 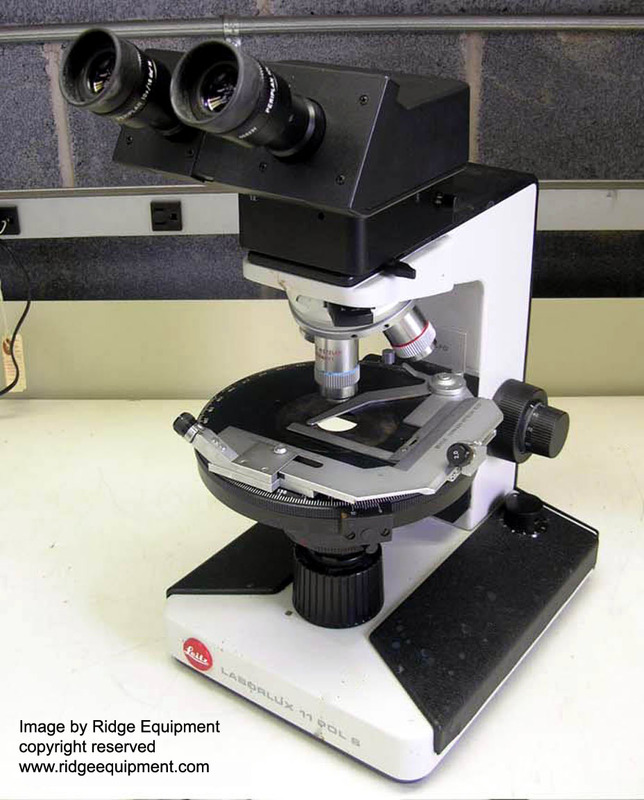 Built in the late 1980s as the final effort by Leitz to outdo any top of the line microscope made by anyone else. Extremely big, expensive, and rare. 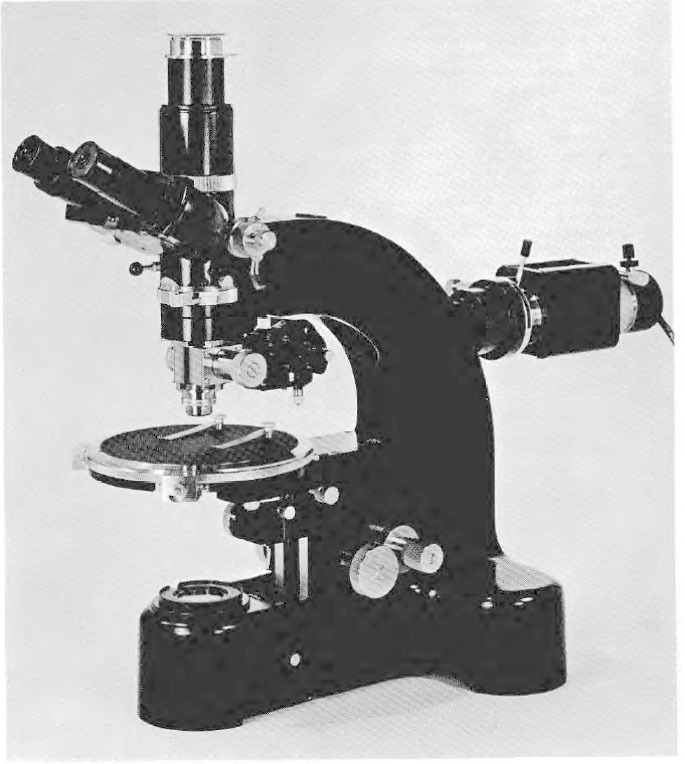 Comparison microscope for forensic work (1970s), which requires a large heavy stand. Thanks to Robert MacInnis for the photo of this rare and interesting model. This is a bayonet-type head attachment, used in Laborlux Pol and SM Pol models. Biological binocular and trinocular Leitz heads usually attach with a circular collar held with a clip system that retracts by a lever on the stand. 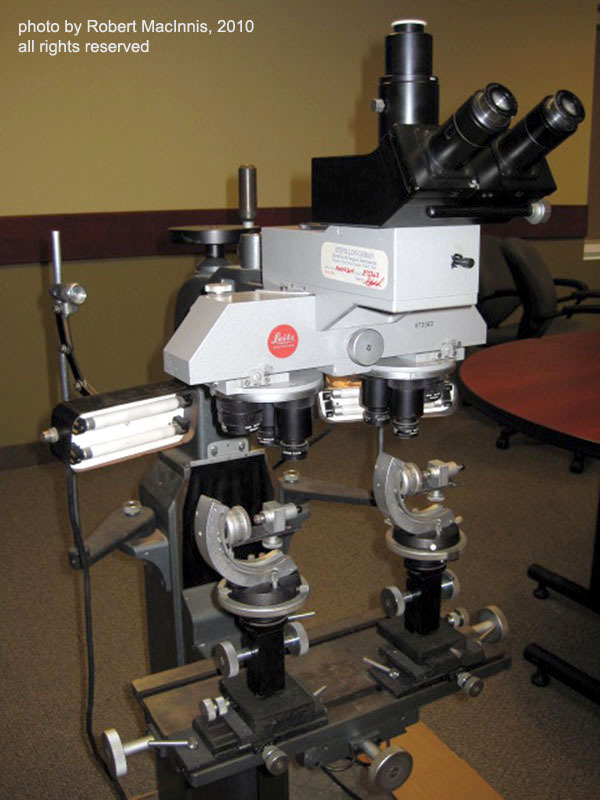 With several attachment systems and sizes, heads cannot be swapped on all Leitz scope models. Berek 2-diaphragm condenser (#76) n.a. 0.90, designed for stands that lack a field diaphragm. 1960s This allows you to get closer to Kohler illumination without regard to the field lens or lamp. Used even on high-end models such as the Ortholux. The strain-free condenser for the Laborlux 12 Pol slides into a dovetail slot with centering bolts, above a rotatable polarizer that can swing out if required. HM Lux Pol stage (late 1970s) The stage surface finish on a good pol scope like this one will usually hold a glass slide in place during smooth stage rotation, and some petrographers prefer to move slides by hand, without clips or X-Y holder. Ortholux-pol stage and X-Y slide holder, 1960s Two X-Y slide holders were made, with one with parts that allow point counting (with extra geared knobs for clicking at different intervals). Identifying minerals while counting for a thousand points to estimate mineral percentages in the rock is somewhat tedious, but a rite of passage for many geology students. 35 mm film camera and exposure viewer with adapter mounted on an Ortholux. After setting the exposure the shutter release is by a manual cable. Light meter for the Leitz film camera (above), used for setting the camera exposure. 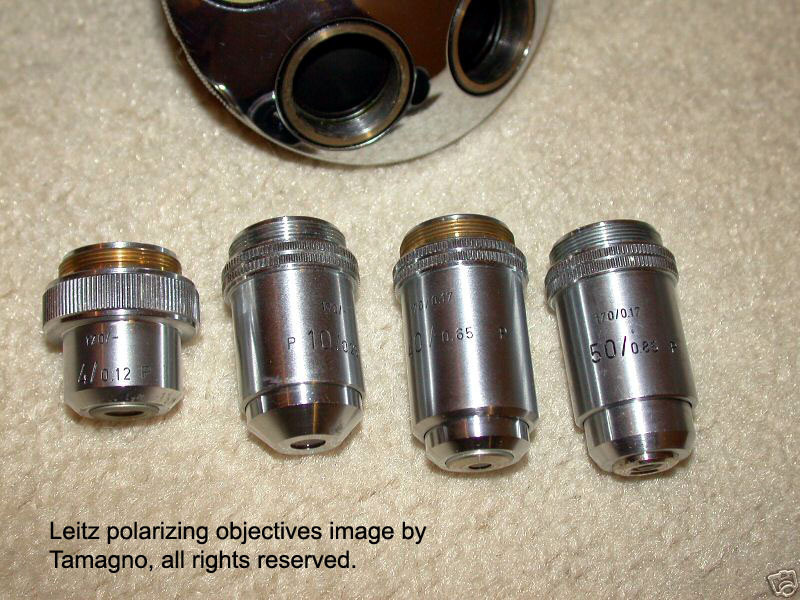 Pol objectives on single-clip holders, and small wave compensator plates of 4x12 mm size, as used in the AM Pol model and other early microscopes. See later wave plates below. Leitz Wetzlar pol objectives (marked with P). 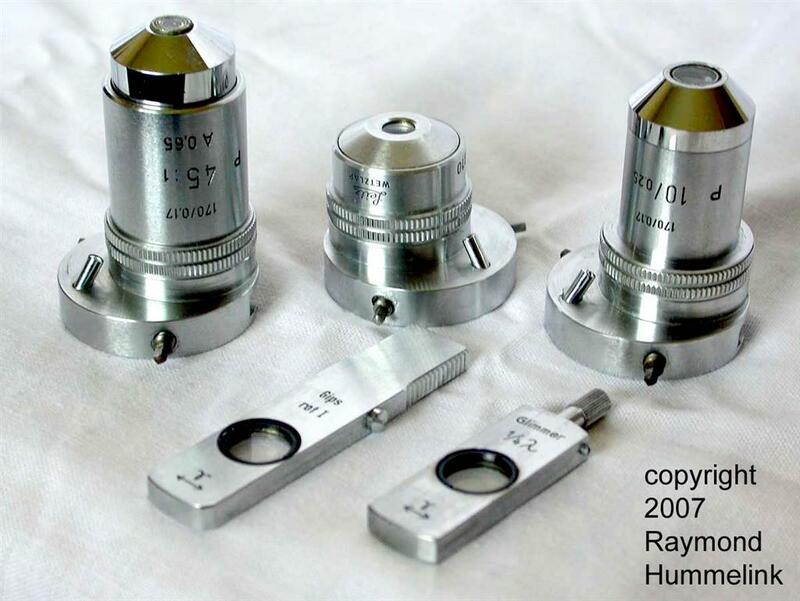 These are the standard achromats, used in any of the 170-mm tube length models. Pl or planar pol objectives were also available. Focal lengths of both 37 and 45 mm were made. Dialux-pol intermediate tube and nose turret. The tube has a Bertrand lens and the analyzer filter, both adjustable. The 5-place turret includes four 37-mm focal length objectives that have been extended to 45 mm lengths with special Plezy pol adapters (to match a very fine low-powered 45 mm objective). Laborlux 12 Pol strain-free objectives are DIN 45 mm length for a 160 mm tube length stand, with barrels sleeves that rotate freely so their labels can be on the outside. The Laborlux 12 Pol centering nose turret angles inward, a style preferred by some clinical users, but this is unusual for a pol scope. Note the handy storage holes for two centering wrenches behind the circular stage. Leitz New York vinyl dust cover. See "What's in a name" below for Leitz New York legal troubles. Universal stages (upper one has 4-axes and can be centered, lower one has five axes). Rock slides can be rotated in 3 dimensions, so that mineral features such as quartz lamellae or particular crystallographic axes can be measured and viewed (including precise extinction angles). Used with a special condenser top lens, and a special objective. They could fit all models except the SM. 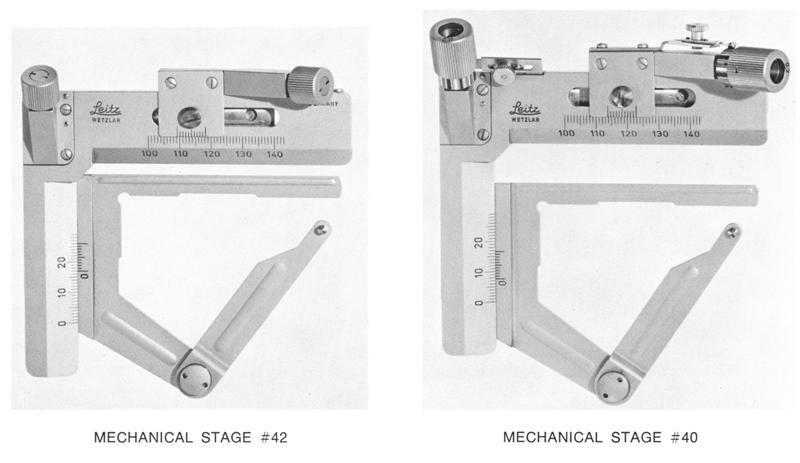 The 5-axis U-stage with centering objective was $1308 in the 1971 catalog, not including other accessories. Two mechanical X-Y stages, for circular polarizing stages. The one on the right has parts for point counting, with replaceable thumb screws that allow different intervals of "click stops." From the 1971 pol scopes catalog. Three wave compensator plates, in 4x12 mm size: (left) whole-wave "gypsum red 1"; (center) 1/4 wave "mica"; (right) quartz wedge covering 4 wavelengths. From the 1971 pol scopes catalog. Another set was made in the 6x20 mm size used in the Orthoplan and later models. Five rotary wave compensator plates (4x12 mm) were made by Leitz (as listed and priced in their 1971 pol scope catalog). 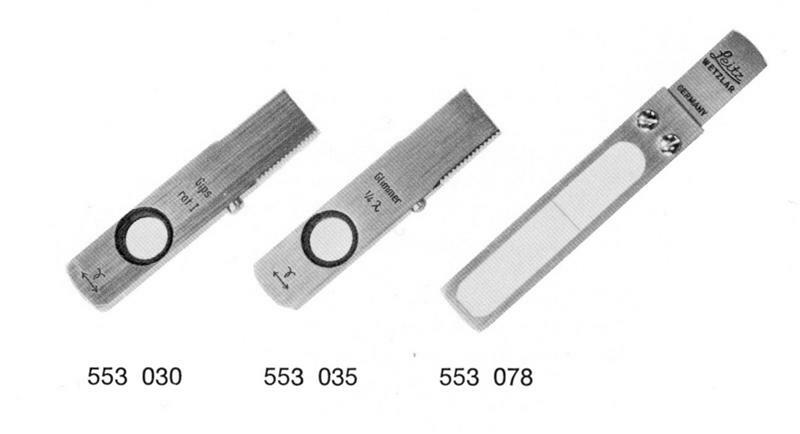 All look exactly alike and must be distinguished by testing, or by their serial numbers. Leitz-now-Leica in Wetzlar can tell you which is which, although they might charge a fee. 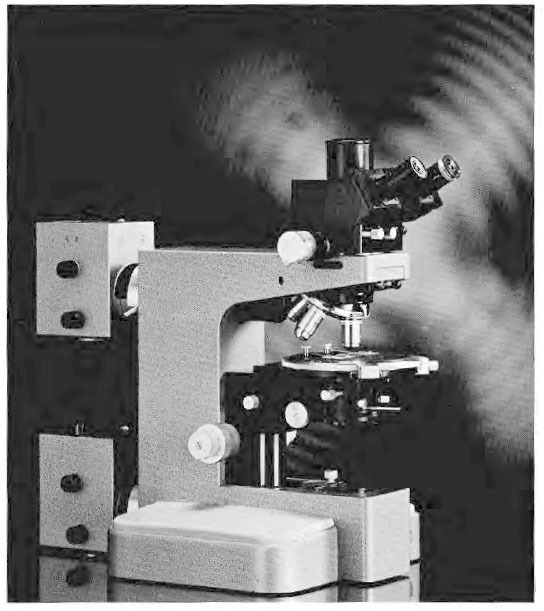 The technique for using such plates to make precise determinations of birefringence is very nicely described by John Gustav Delly of McCrone Labs in this Modern Microscopy article. 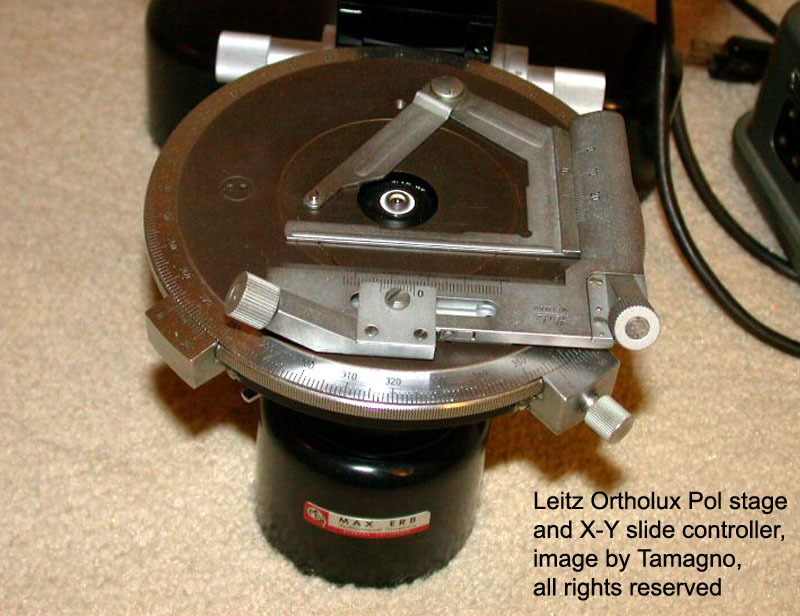 Several Leitz documents and photos are posted in Yahoo Microscopes Group files. Also see this repository of Leitz catalogs (free to download, but donations are requested). This company sells scans of Leitz and other microscopes. Some Leitz scopes of the 1960s, being refurbished in my shop. "If it's not black, then send it back."